My last post featured music constructed around a repeating bass line, or ostinato. We listened to Johann Pachelbel’s famous Canon in D as well as passacaglias by Handel and Bach. Now, let’s return to the ostinato with another type of musical composition that was popular in the Baroque period, the chaconne. Like the passacaglia, the repeating bass line of the chaconne gave Baroque composers a great opportunity to write endlessly inventive variations. Most chaconnes are built on a four note scale that descends from the tonic (the home pitch of any key) to the dominant (the fifth scale degree). This simple four note pattern creates its own satisfying drama. Listen to the chaconne bass line. Can you feel the pull of the lowest note (the dominant) back to the first note (the tonic)? With each repetition of this bass line, the music moves away from “home” and then returns. Suzuki violin students know Jean Baptiste Lully because of his Gavotte in Book 2. Lully was one of the most important French Baroque composers and was especially influential in developing French opera. This chaconne comes from the Third Act of his opera, Roland. If you like this music, you might also enjoy another chaconne Lully wrote for the opera, Phaeton. There are many great recordings of Bach’s Sonatas and Partitas for Solo Violin. Recordings I recommend include performances by Henryk Szeryng, Hilary Hahn, Julia Fischer, Ilya Kaler, Gidon Kremer, Arthur Grumiaux and Mela Tenenbaum. Tenenbaum’s recording features a separate CD with her thoughts on the music and is worth exploring for any musician who is studying solo Bach. 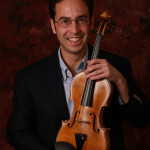 Here is a performance by the legendary Russian violinist, Nathan Milstein. In 1993 American composer John Adams wrote a chaconne for the second movement of his Violin Concerto. It’s easy to hear echoes of the past in this haunting and atmospheric music. In what ways is this chaconne similar to its Baroque predecessors? In what ways is it different? What feelings does the music evoke? Interestingly, this song from the British band, Sade is built on the same descending chaconne bass line that Vitali, Lully and other Baroque composers used. Good post. Although, I would say Sade is an individual singer/artist, not a band. You’re right that Sade is the singer, TKO and it’s probably clearer to give her the credit as an individual. When I was preparing this post I was actually surprised to see that her band is also apparently known as Sade and that’s why I referred to it that way. Regardless, she’s a really talented artist.